This Cot Size (30 x 74 ), or 33 Wide Size or 39, also available in 80 long foam mattress contains all of the essential features you need to achieve deeply refreshing outdoor or everyday night sleep. This foam mattress is available in 3, 4, 5 or six inch. We have design this with durable firm foam padding that provide long-lasting therapeutic support. A comfortable plush foam covers the firm foam provide the extra cushion you need for rejuvenating rest. 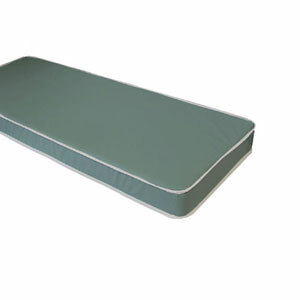 Along with that comes an attractive green vinyl water-resistant fabric that covers this mattress to help eliminate germs, bacteria’s and dust mites. It will support your lower back during camping nights, and provide the correct lumbar support. Great for Home, guest, Travel, and all other events.